Vacationing overseas can be a rich and rewarding experience. But it doesn’t have to be an experience just for the rich. AESU, the most trusted name in travel, offers travel programs for college students and young professionals at affordable rates. Each trip is action-packed, informal, and won’t break the bank. So now you can take that vacation to Lucerne that you have always dreamed of. Lucerne is a city located in central Switzerland. 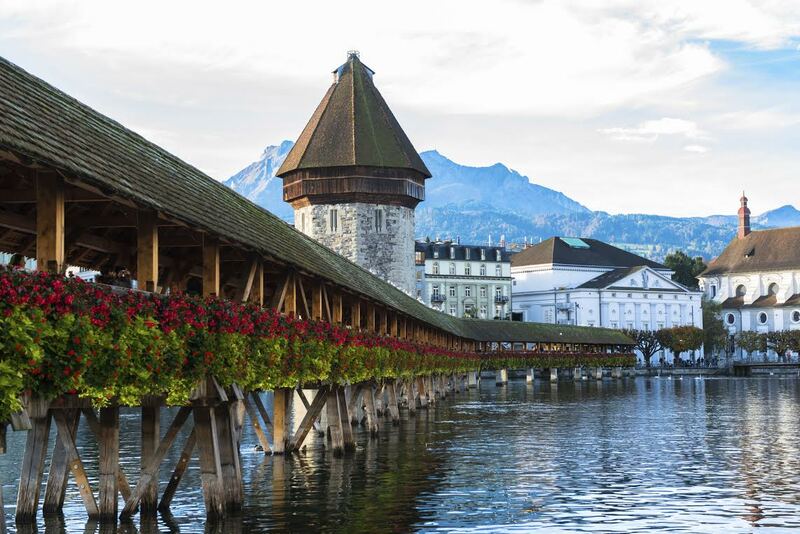 This ancient town is home to some breathtaking historic architecture, including one of Europe’s oldest covered bridges, as well as several modern luxuries, such as the KKL, a concert hall and art gallery. And this is just the tip of the iceberg of what Lucerne has to offer. The top of Mount Pilatus is only reachable by the Pilatus railway, the world’s steepest cogwheel railway (May to November), or cable car. The only thing better than the view during your trek to the summit is the view once you have reached the top. Mount Pilatus is also home of the biggest suspension rope park in Central Switzerland, and the longest summer toboggan track in the country. Speaking of breathtaking views, Lake Luzern is the fourth largest lake in Switzerland. Taking a boat trip is the best way to explore all Lake Luzern has to offer. This 204 meter (670 foot) long bridge crossing the Reuss River is the world’s oldest surviving truss bridge, as well as the oldest wooden covered bridge in Europe. Named after nearby St. Peter’s Chapel, the Kapellbrucke, also known as Chapel Bridge, is truly unique because it houses a collection of paintings from the 17th century. Much of the bridge and artwork were destroyed in a 1993 fire, but it was promptly restored. Euro Spree is a 14-day vacation highlighting the “best of Europe,” from the snow-capped Alps and, of course, Lucerne to the world’s most romantic city, Paris, and everything in between. Well, maybe not everything. But this unforgettable two week trip takes you on a whirlwind tour through eight great countries. Want help booking one of our Affordable Trip to Lucerne? Please contact AESU by calling 800-638-7640 or fill out the contact form found on our website. And don’t forget to check out all of our great Travel Tips, especially the Travel Tips for Europe, before you head overseas. This entry was posted on Thursday, February 26th, 2015	at 10:07 pm	. You can follow any responses to this entry through the RSS 2.0	feed. Both comments and pings are currently closed.